Are you feeling constantly hungry? Many training methodologies (including running, cycling, Zumba and CrossFit, among others) can be demanding routines of workouts that leave your stomach empty pretty quickly, especially if you are not a professional athlete that devotes every day to fulfil their bodies with nutritious food, but instead you would find yourself everyday at your desk biting your fingers or rumbling through your drawers for a snack. You’re not alone. Keeping the right kind of snack handy will also helps those cravings while not messing so much with your diet. A piece of fruit, yogurt, nuts and plenty of water can get you started. More often than not we confuse thirst with hunger, so it might be that you aren’t drinking enough water. Fruit juices are not especially good as they may have lots of sugar and carbohydrates and less water than expected. Try drinking a whole glass of water and then wait 10-20 minutes. If you’re still hungry, have a healthy snack. Sleep deprivation has been found to increase levels of stress hormones and resistance to insulin, both of which also contribute to weight gain. Try to aim for seven to nine hours of sleep per night and avoid caffeine near your bedtime, as it can keep you awake and disrupt the normal stages of your sleep. Take a lunchtime break or catch up with other friends over lunch. Watching TV while eating blocks the feeling of satisfaction because your brain is focused on other things, like what you are actually watching. Make sure you sit down at dinner at the table with your loved ones and turn the TV off at a regular time to eat your meals. It doesn’t take long to build a habit but once built is really hard to break them. Alcohol mess up your body’s perception of hunger, satiety and fullness and stimulates additional eating, or adds additional calories that aren’t compensated for, which lead to get fat in your belly, thanks to what booze does to hormones. Alcohol also lowers inhibitions so common sense won’t kick in and stop you from consuming those fat and greasy chips. Drink in moderation and be aware of additional calories from food consumed during or after drinking. For starters, skipping just one meal causes your blood-sugar levels to dive and without a new supply of calories, your system shifts into starvation mode in an effort to conserve energy. Your metabolism slows and you become foggy, moody and irritable. When you do eat again your body feels relief but only for a short time. Make sure to eat quality, nutrient-rich food as lean protein combined with carbs from whole grains and some good fats. Losing weight slowly by keeping your food intake up means your system will barely notice the difference and you’ll also be less miserable in the process. When you are unhappy or stressed you’re more likely to binge eating. This comes from food used to comfort and soothe, especially fatty and sugary foods when we were kids. When things go well we celebrate with food. When things go wrong, we console ourselves with food, right? Rather than eating your emotions, go for a walk, or crank up the music and dance around the house pushing the vacuum cleaner. 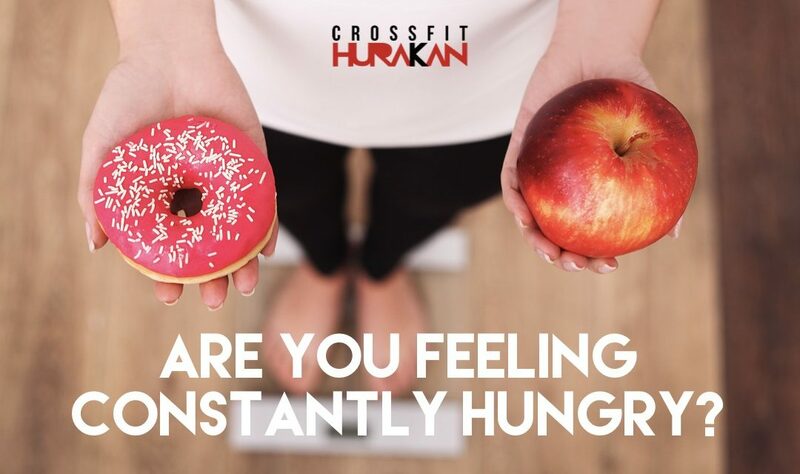 There is nothing that can bother your mind after one of our classes at CrossFit Hurakan even if you feel you had a really bad day (or week). Whatever you do, please don’t start eating! Yes, it’s simple, you’re training hard so your body wants more fuel. Hunger is the body’s way of asking to be refueled, so don’t ignore a rumbling stomach, particularly if you’ve recently started working out or ramped up your exercise routine. Stronger hankerings than usual may be a sign your body and brain are adapting to a new set of physical challenges, but craving tons of treats may also be the mind’s way of asking for equal attention in the form of rewards and comfort food. Try to tune in to the difference between physical hunger and the emotional desire to eat, and hang in there as you learn to accommodate new habits. Opting for more fruits and veggies will promote feelings of fullness, and staying fueled and hydrated throughout each day could stave off binges. Do something. Just having a ‘little treat is a classic way to procrastinate. Write yourself a list of tasks that you need to do and stick it on the fridge. That way instead of opening the fridge for food, you can remind yourself of something else to do instead. When you feel like eating, always pause in that moment between wanting to eat and actually eating. This is where you’ll figure out if you’re hungry or just bored, tired, stressed, or thirsty. You shouldn’t necessarily be eating every two or three hours like some experts suggest, only when you’re truly hungry, but that you can check in every two or three hours if you’re busy and often forget to eat until you’re starving. When you consume nutrient rich food that contains more fibre, protein and water, you feel fuller for longer as compared to sugary and carbohydrate filled foods like doughnuts because these are nutrient empty foods. Eating too many of certain kinds of carbs has many bad effects on our bodies; we gain body fat because we overeat, we feel more stressed out, we have trouble controlling what we eat and, we might develop some level of insulin resistance, elevated triglycerides, among other health problems. 10. Are you eating because it’s convenient? You keep your food in arms reach at all times. Get rid of the desk drawer chocolate bars or candy bowl – that way you won’t consume these empty calories. I bet you’ve never go to the cinema without your popcorn or event and M&Ms or choctop throw in there. Wrong! You’re not hungry. As you watch the movie, you start picking at the popcorns. By the end the entire food is gone, and you hardly noticed yourself eating them. Try avoid going out on an empty stomach or if you are very keen to still have popcorns, choose a small portion and water instead of a soft drink or bring your own snacks.